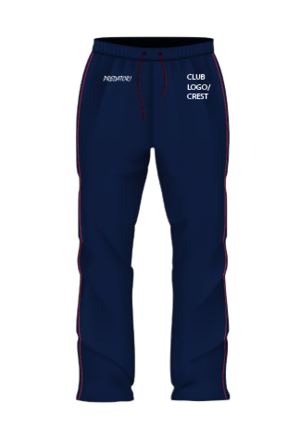 Predator’s tracksuit bottoms are retail quality and completely bespoke to your club. These will be ideal for your players to wear before and after sessions to keep you warm. Made with 200gsm microfibre with a full cotton lining and reinforced seams, your tracksuit bottoms will last wear after wear. Benefit from an elastic drawstring waist, two zip pockets, ¾ leg full zip and ankle toggle as standard – ensuring comfort and quality. Embroidery and heat transfers are available to personalise your team kit. Our design team can help with redrawing logos so your stadium pants match perfectly with your playing kit. Tracksuit Bottoms cannot be ordered online. Minimum Order quantity is just 10.